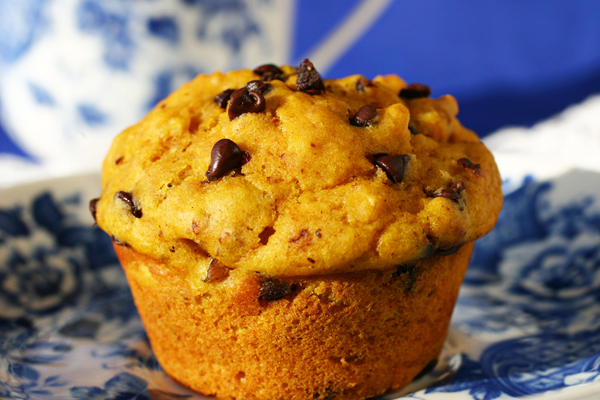 Here’s an easy recipe for my pumpkin chocolate chip muffins. Even without the chocolate chips, they are still a great tasting snack. My recipe includes toasted walnuts and trust me, toasting the nuts first will send their flavor into overdrive. I use walnuts and pecans in lots of baking so I just toast a bunch of each one in the oven (see my video) and keep them in the fridge for baking. It doesn’t have to be pumpkin season to make these yummy muffins, in fact canned pumpkin has more antioxidants than fresh. Orange and yellow vegetables like pumpkin, sweet potato, and carrots have lots of betacarotene which is good for your lungs and eyes and will give you healthy hair and skin. The most important thing about making muffins is not to over-mix. Just fold the ingredients together gently with a spatula or spoonula – I love those! This recipe was in my first cookbook and I’ve updated it by increasing the whole wheat pastry flour a little and switching from canola to extra light olive oil but you can use any oil of your choice. I’m posting this recipe by request from a fellow baker (Rori) in Denver who lost the recipe. Here it is, Rori! Click here for the recipe. If anyone else has a recipe request, just let me know…. 8 Comments on "Pumpkin Chocolate Chip Muffins"
Hi Jenny. I would like to request if you could make a “Traditional Fruit Cake”. I am a big fan of fruit cake. One of the best fruit cake I’ve ever tasted was brought Costco. How about your recipe (with video) on this please? I made your no knead bread for the first time. You’re right. It was fun to make. The crust was very crispy. However, I found the inside to be too moist. My oven was at 450. I left it uncovered for 15 minutes and took it out then because it was very brown and I didn’t want to burn it. Is this usual? Did I do something wrong? Help! Please look at these notes about no knead bread: https://www.jennycancook.com/no-knead-bread-questions/ Assuming you followed the recipe exactly, you may have just sliced it too soon. I have never made a pie crust with walnuts but I have with ground almonds and it was great. Excited to read your new muffin recipe. I personally don’t care for chocolate with pumpkin, but look forward trying them without! Have a great weekend and MORE VIDEOS PLEASE! I look forward to them.